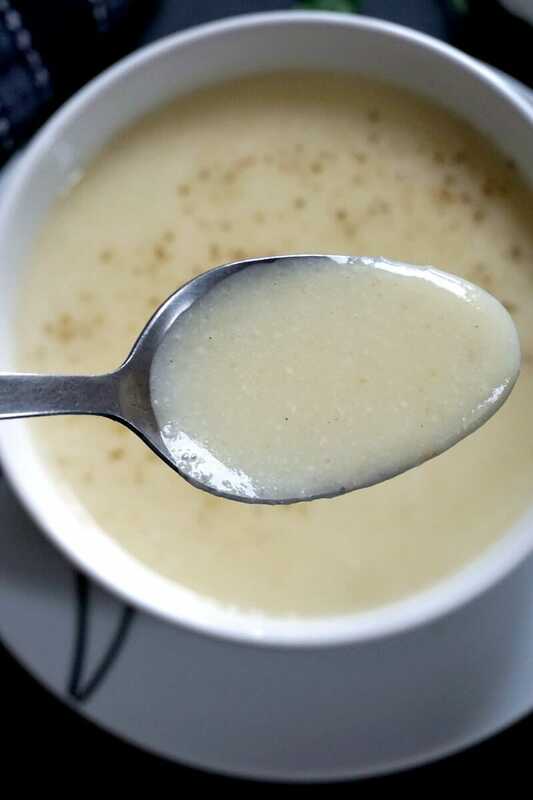 Easy Cream of Garlic Soup, a natural remedy for cold and flu. Soothing and flavourful, this vegetarian soup is ready in well under 30 minutes. ‘Tis the season of colds and flu and other nasty viruses. As much as I try to stay away from them, they always get to me when I least expect it. The regular medicine never seems to work to soothe away the discomfort, not the way a steaming hot bowl of soup can do anyway. 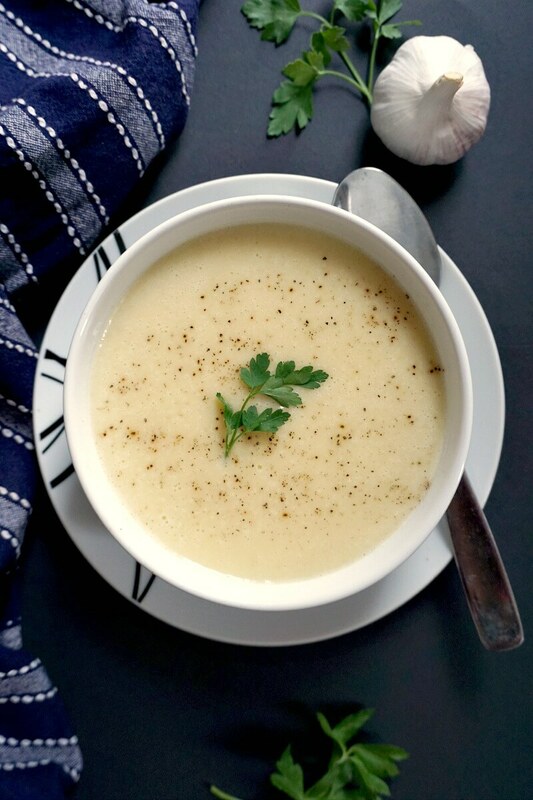 This cream of garlic soup is the best you can get in winter. 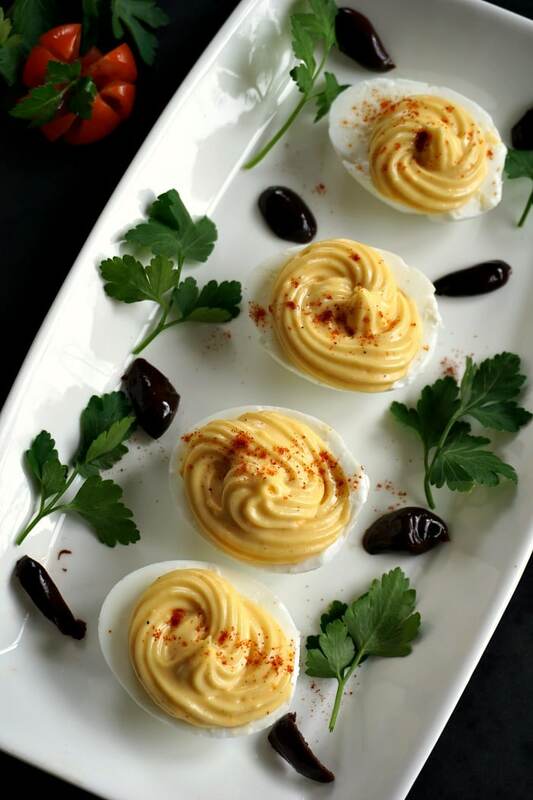 It’s got a delicate texture and flavour, and hits the spot every single time. Unike raw garlic, which is pungent to say the least, the cooked garlic looses that sharpness, so you don’t need to worry about having to use a whole bottle of mouthway after a bowl of soup. Although the soup uses 3 whole heads of garlic, you can’t really tell it’s that much, since the flavour is pretty subtle. I used garlic for another great favourite of mine, the Chicken Soup with Garlic and Sour Cream, and, although it had less garlic, it was still rich and flavourful. 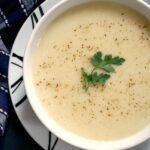 How do you make creamy garlic soup? This soup is super simple, and is ready in well under 30 minutes. 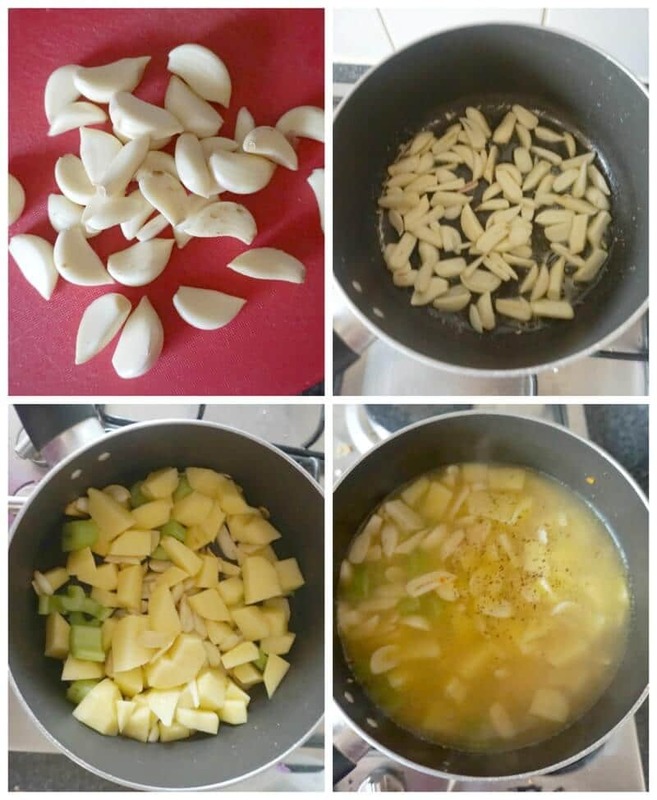 You can add more garlic if you wish, that should not change the texture of the soup. Peel and slice the garlic, add a know of butter and a teaspoon of olive oil to a pan, add the garlic and sautee for one minute. Be careful not to cook the garlic for longer, as it can easily become bown and become bitter. Peel and chop 3 medium potatoes and one celery, add them to the pan together with 3 cups of vegetable stock (broth) or enough to cover the potatoes. The amount of liquid can be more of less, depending on how thick you like the soup, mine was pretty thin, but that’s entirely up to you. Cover the pan with a lid and cook on a medium heat for abput 15-20 minutes, or until the vegetables are tender. Add everything to a blender, and blend until smooth. Add the Greek yogurt, or cream of if like, season with salt and plenty of black pepper, and garnish with parsley. How do you add yogurt or cream to a hot soup to avoid curdling? It’s important to have the yogurt (cream, sour cream or anything else you add) at room temperature before adding to a hot soup. 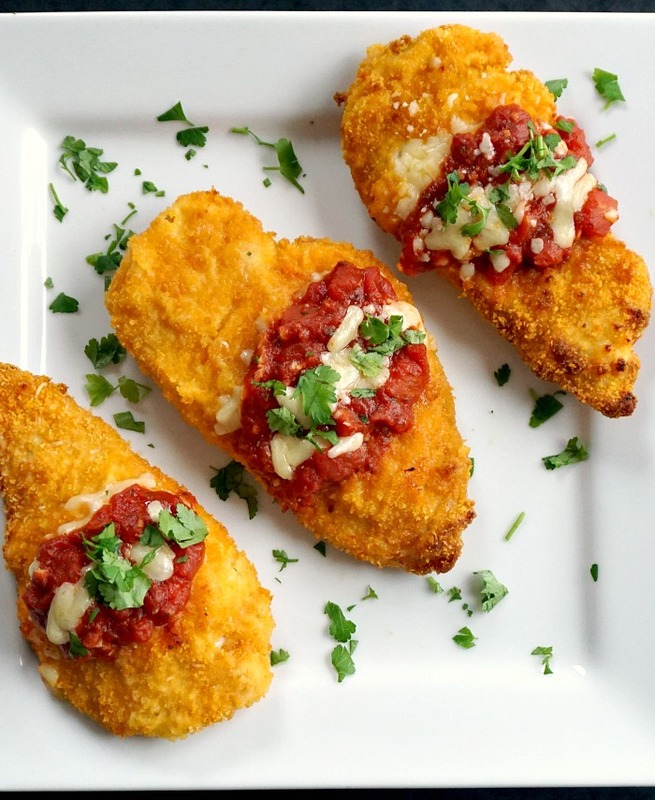 Even if it curdles, the taste is still good, but the texture won’t be as nice and smooth. So we need to temper the yogurt first. Add one spoonful of hot liquid to the yogurt, mix well, then add a few more, until the yogurt is warm. When it’s added to the soup, the texture won’t change, and the soup will be creamy and smooth. 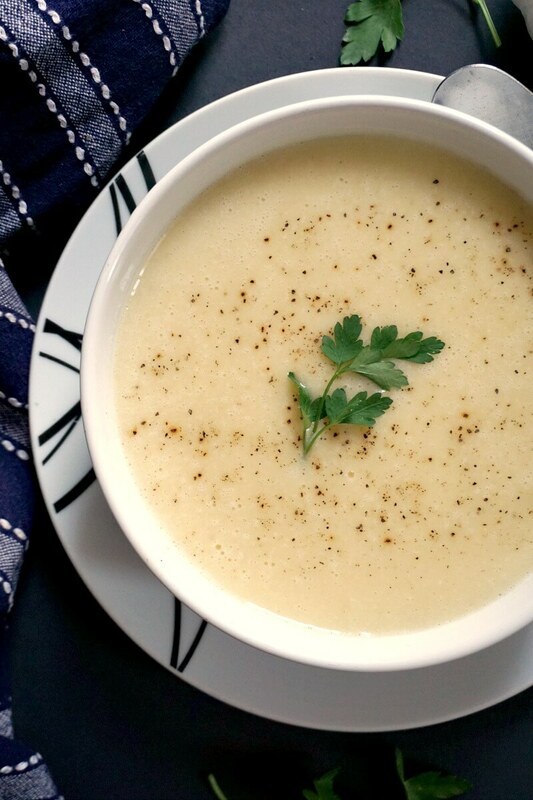 If you’ve tried this EASY CREAM OF GARLIC SOUP or any other recipe on the blog then don’t forget to rate the recipe and let me know how you got on in the comments below, I love hearing from you! You can also FOLLOW ME on FACEBOOK, and PINTEREST to see more delicious food and what I’m getting up to. In a pan, heat up the oil and butter, add the garlic, and stir for about one minute, so that the garlic can soften a bit. Peel and chop the potatoes and celery, add them to the pan together with the vegetable stock and cook for 15 minutes, or until the vegetables are tender. Transfer everything to a blender, and blend until smooth. Add one spoonful of soup to the yogurt, mix well, then add a few more spoonfuls until the yogurt is warm. The yogurt can now be added to the soup. 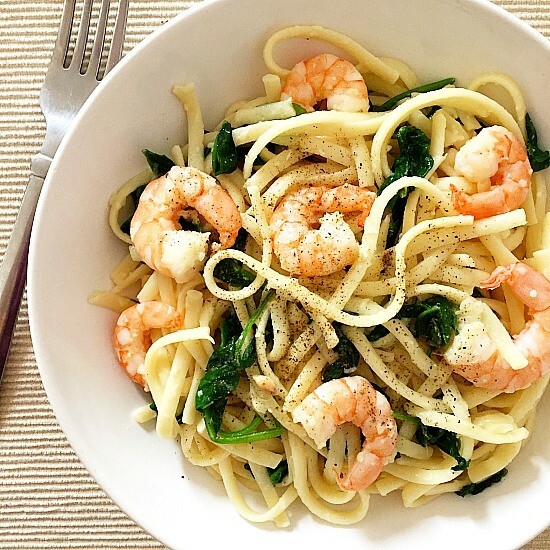 Mix well, season with salt and pepper, and garnish with parsley.